I don't really like apt-get, and since Ubuntu 10.10 (Maverick Merkat) there is no aptitude in default installation, so first I'm going to install that. Aptitude is basically the same thing as apt-get but it has user interface and is much more user friendly. At Do you want to continue [Y/n], enter Y and press Enter. Exit aptitude by hitting Q key twice. dma - The DragonFly Mail Agent is a small Mail Transport Agent designed for home and office use. We don't want to install Postfix or similar just to send simple messages. safecat -Safecat copies standard input to a qmail-style maildir as reliably and quickly as qmail itself. It can be used to deliver mail messages to qmail folders, or to spool data securely for later use by non-email-related applications. We will use it to process double-bounce messages. emacs23-nox -My preffered text editor (nox means No X, as it will not install GUI frontend for desktop managers like Gnome and KDE). You don't have to install emacs if you don't like it. Choose your preffered text editior here. debconf-english -This package is an alternative to the debconf-i18n package, intended for systems that are administerd only in english, and low-footprint systems. debconf-i18n_ -full internationalization support for debconf. You noticed "_" at the end of the package name. It means I don't want it so I have used the "_" character that aptitude will understand as purge order. It will remove the package and it's installation files from our system. bsd-mailx -mailx is the traditional command-line-mode mail user agent. Even if you don't use it, it may be required by other programs. sysfsutils -This package ships a configuration file /etc/sysfs.conf which allows to conveniently set sysfs attributes at system bootup. We will use it to configure some options on our disks later. localepurge -Reclaim disk space by removing unneeded localization files. If you intend to use generic image on other machines/VM's, leave the System mail name as it is and press Ok to continue (as it will be configured on the machine/VM you intend to use it on). If you intend to use generic image on other machines/VM's, leave the Smarthost empty, as it will be configured on the machine/VM you intend to use it on. Make your choice (usually it's not necessary), and press Ok to continue. As I stated at the beginning of this tutorial, what you have now is a great starting point for all of your future Ubuntu projects. 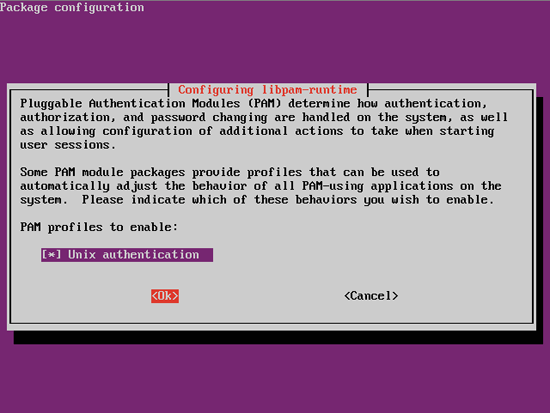 Don't forget at least to change host name and network settings when cloning this installation to other machines/VM-s to avoid possible conflicts, and enjoy Ubuntu. That's all folks! is the first command run on the new system even before fixing the NTP servers to point to our internal time server.